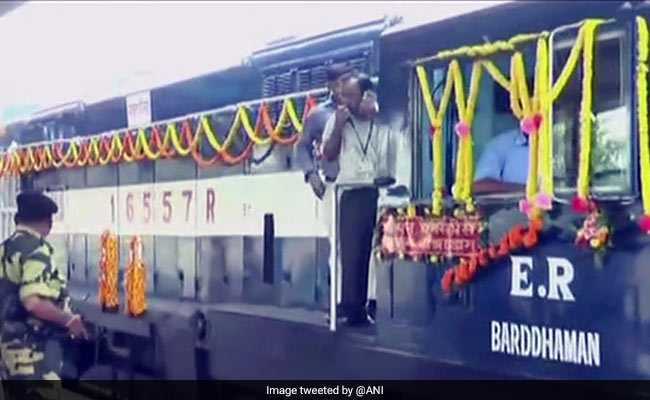 New Delhi: A new passenger train between West Bengal and Bangladesh, Khulna-Kolkata Bandhan Express, was flagged off today by Prime Minister Narendra Modi and Bangladesh Prime Minister Sheikh Hasina via video conferencing. The train will connect Kolkata to Khulna in Bangladesh. This will be the second train to run between the two countries after Maitree Express that runs between Dhaka and Kolkata. The word Bandhan means 'bond' in English and the new train is a bid to ease communication between the two neighbouring countries and bond them better. While flagging off the train service, PM Narendra Modi said, "I believe that relations between leaders of neighbouring countries should be like neighbours. We should not be in restrictions of protocols for visits or talks." While the train had an inaugural run today, the commercial service to Bandhan Express will begin on November 16. The fully air-conditioned train will run every Thursday. The distance between Kolkata and Khulna is 172 km with a journey time of four and a half hours. The journey will have two intermediate stations - Petrapole, with a stoppage time of 10 minutes, and Benepole, with a stoppage time of 15 minutes. The Maitree Express between Dhaka and Kolkata, which has been running since 2008, is popular. It runs six days a week from each side, covering a distance of 375 kilometers in 11 hours. There are two stops for immigration checking; one is Gede in India and the other is Dorshona in Bangladesh. The two new bridges have been built on the Bhairab and the Titas rivers to provide an "end-to-end" immigration facility to ease Dhaka-Kolkata Maitree train services. PM Modi, who also inaugurated two rail bridges, built at a cost of around $100 million, said they will strengthen Bangladesh's rail network. "To be a trusted partner in Bangladesh's development is a matter of pride," said the Prime Minister. Bangladesh Prime Minister Sheikh Hasina said, "Today is a great day for relations between the two countries with the inauguration of the train services and the two bridges. This train service is a dream come true for people on both sides of the border." West Bengal Chief Minister Mamata Banerjee described the launch as a remarkable day for India and Bangladesh. "The relations between the two countries will strengthen in the future," she said. "There is also a proposal from Bangladesh side to launch a train to connect Rajshahi in Bangladesh and Kolkata," said Bangladesh railway minister Mujibal Haque last week.